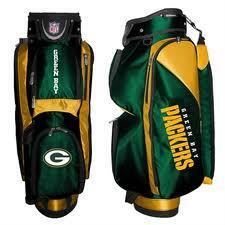 NFL Golf Cart Bag by Wilson-Most Teams Available | Sports Memorabilia! 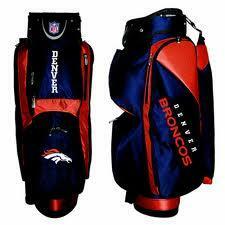 These are deluxe golf cart bags by Wilson Sporting Goods. Features 5 closed pockets, external putter well holder, towel/glove holder, umbrella holder, rain/travel hood. Limited teams available: Arizona, Atlanta, Baltimore, Buffalo, Carolina, Chicago, Cincinnati, Denver, Green Bay, Houston, Indianapolis, Jacksonville, Jets, Miami, Minnesota, New England, New Orleans, Philadelphia, Pittsburg, Rams, Seattle, Tampa Bay, Tennessee, Washington. Other teams Sold Out. In the comment box on the shopping cart, please specify team. We will confirm availability with you by email. Your credit card will not be processed until available inventory is confirmed.